Alnwick Town FC news and match reports. 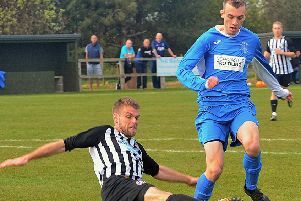 Alnwick Town notched up the heaviest defeat in the Northern League today with a nine-goal trouncing from Seaham. It takes Town’s tally to 100 goals against in the league this season. The black and whites travelled to top-of-the-table Seaham Red Star, still looking for their first win this year. But it wasn’t to be and at half-time the home team had knocked in three. The goals came thick and fast in the second half, with the final score at 9-0. Alnwick’s next league game is at home to Norton & Stockton Ancients on Saturday, February 14.